We tend to think of cities as a realm apart, somehow separate from nature, but nothing could be further from the truth. 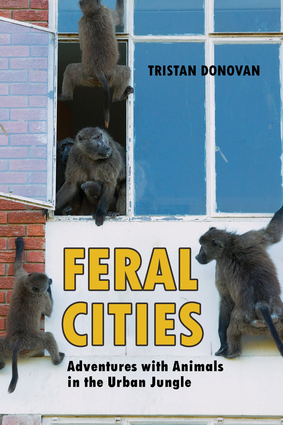 In Feral Cities, Tristan Donovan digsbelow the urban gloss to uncover the wild creatures that we share our streets and homes with, and profiles the brave and fascinating people who try to manage them. Along the way readers will meet the wall-eating snails that are invading Miami, the boars that roam Berlin, and the monkey gangs of Cape Town. From feral chickens and carpet-roaming bugs to coyotes hanging out in sandwich shops and birds crashing into skyscrapers, Feral Cities takes readers on a journey through streets and neighborhoods that are far more alive than we often realize, shows how animals are adjusting to urban living, and asks what messages the wildlife in our metropolises have for us. Tristan Donovan is the author of two widely praised books, Replay: The History of Video Games and Fizz: How Soda Shook Up the World. His journalism has appeared in many major newspapers, magazines, and websites. He has a degree in ecology.